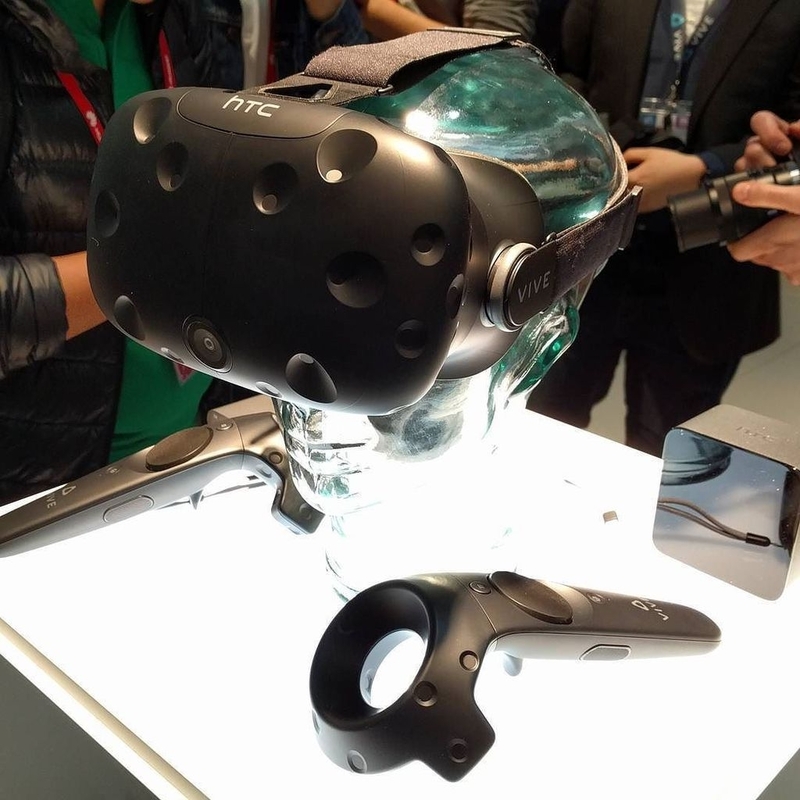 Updated: The photo above is showing the finalized consumer version of the Vive on display at MWC 2016. Scroll down below for a few more shots. HTC's Vive VR headset, considered by many to be the only serious competitor to the Oculus Rift, now has a price and release date. If you were put off by the "high" price of the Oculus Rift, HTC won't provide any solace. The Taiwanese technology company revealed at Mobile World Congress that its Vive VR headset, built in collaboration with Valve, will retail for $799 – a full $200 more than the Facebook-owned competition is commanding. For that price, buyers will receive the headset itself, two wireless controllers with haptic feedback (one for each hand) and a pair of "Lighthouse" laser base stations for tracking purposes. It's worth mentioning that the Oculus Rift doesn't include any motion-based controllers, instead shipping with a standard Xbox One controller (and two games: Eve: Valkyrie and Lucky's Tale). Motion controllers for the Rift are slated to arrive later this year although pricing remains a mystery at this hour. As UploadVR notes, the consumer version of the Vive is virtually (no pun intended) identical to what was shown at CES back in January. The only notable difference to the actual hardware is a more ergonomic head strap. There's also a new feature called Vive Phone Services that lets you place and receive calls and text messages without removing the headset and a front-facing camera to connect users to the "real world." Other notables include an internal microphone and Bluetooth connectivity (presumably to use the aforementioned smartphone features). Like the Rift, the Vive VR comes with a pair of games: Job Simulator: The 2050 Archives from Owlchemy Labs and Northway Games' Contraption. HTC recommends an Intel Core i5-4590 / AMD FX 8350 equivalent processor or better, an Nvidia GeForce GTX 970 / AMD Radeon R9 290 or greater, at least 4GB of RAM, an HDMI 1.4 / DisplayPort 1.2 video output or newer, at least one USB 2.0 port and Windows SP1 or newer to get the best experience out of the Vive VR. HTC will begin accepting pre-orders on February 29 with plans to ship in early April.